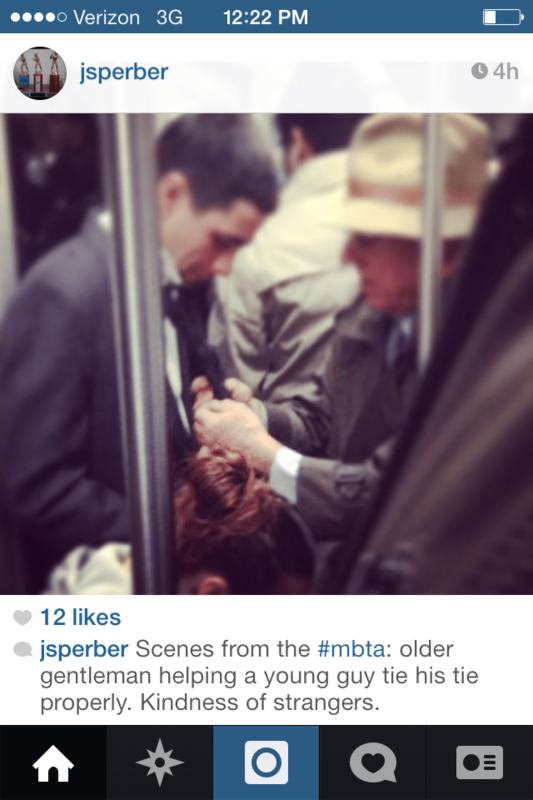 Jodi Sperber snapped this photo of an older man helping a younger man with his tie on the T in Boston. I love it and shared it online (after getting Jodi’s permission). Gilles Frydman points out that the best advice doesn’t just come from a “just-in-time someone-like-me” but from one who is ahead of you on the path, like this older man helping the younger one. I’m struck by how often people share stories of serendipity and unexpected altruism when they talk about their health. Has something like that happened to you? Someone emerging at just the right moment to give you the help or advice you needed? If so, I’d love to hear about it, either in the comments or via email: sfoxdc at gmail dot com. I talk about this with my wife every so often. Our daughter Eve was born with a bad mitral valve, and WPW. She was going into heart failure around 48 hours after birth. The round in pediatrician heard a murmur, and there just happened to be echo cart and tech in the hospital. The cardiologist that read her echo had her transferred to the NICU immediately. By chance he also had worked under the cardiac surgeon at Boston Children’s that was one of two surgeon’s with experience in her valve repair, and the cardiologist in Boston that could perform an ablation to fix her WPW. We had a choice to move our daughter in the very beginning of this process, and it was a coin flip to stay in the system that found her heart problem. Looking back it feels more than serendipity, happenstance, or luck. Many more things aligned for the best outcome that we could imagine. Several years later, an eye appointment led to a MRI for the same daughter. The MRI showed a large brain tumor that needed to be removed. This happened in the span of a couple weeks. Maybe we’re lucky, or there’s something more at play. Your daughter has had two very significant setbacks and has benefited from two very significant leaps forward in the game of life. What I’m learning is that there’s no coming out even, there’s just keeping on. What do you think? It is an interesting thought. I would describe it, as a “new normal”. People adapt, and time moves along. It sometimes provides people with an accelerated view of mortality and time. It can provide you with the fuel to give your life additional purpose. I always looked at our decisions with our daughter’s heart surgery through a time lens. It made the choices more binary. What choice will buy her more time to live for technology to have advanced making her next procedure more routine, with less risk.